Some might say that fall is no time for lightweight tops, but I beg to differ. I love to layer my outfits and these kind of trendy tops are a great way to avoid looking bulky while still wearing multiple layers, such as cardigans, vests, sweaters and coats, to protect yourself from the cold and still be fashionable. They are also a great way to add a touch of feminine color to a mostly dark (black, brown, blue, grey) fall wardrobe. 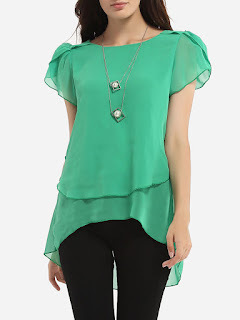 If you need to shop for fashion tops, I suggest you take a look at www.fashionmia.com - they carry tons of different styles and colors, so you'll definitely find something you'll love. Some of my favorites are the loose chiffon tops with cute little details like buttons, splits and interesting sleeve or neckline designs. The colors I'm loving right now are the dusty pastels: not as sugary and cheerful as spring/summer pastels, but are enough to put you in a good mood for the day and they can also look really polished and elegant. Wear dusty pink with grey, mauve with navy blue and taupe with rich dark shades of brown for a beautiful fall/winter color palette. 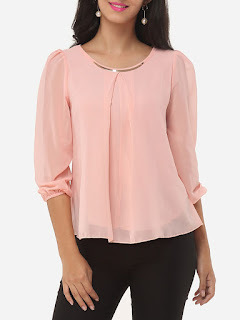 Find more cute tops online here!